Harker Team Places Fifth Nationally in National Science Bowl in Washington, D.C. 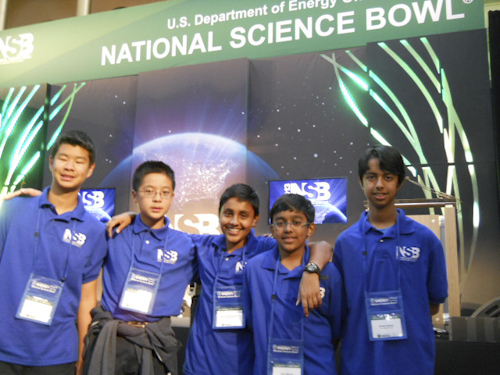 In late April, grade 8 students Venkat Sankar, Arjun Subramaniam and Davd Zhu and grade 7 students Edgar Lin and Rajiv Movva traveled to Washington, D.C., for the National Science Bowl, in which the team placed fifth overall among 46 other teams hailing from 34 states. Middle school science teacher Vandana Kadam called the placing “a huge achievement for a school that started Science Bowl just three years ago.” Remarkably, the team went undefeated for the first nine rounds of the competition, and were just two rounds away from the championship match. The team also managed to place 12th in a non-academic portion of the event in which the students had to build a vehicle that could carry a container of salt a distance of 20 meters in the shortest possible time, powered by a lithium ion battery. The Harker team’s vehicle went the distance in 7.6 seconds, just over one second longer than the first-place finisher’s vehicle. Not ones to let a trip out of state go to waste, the students also saw the many sights offered by the nation’s capital, including the Natural History Museum, the Lincoln Memorial and the Capitol Building.